The federal Clean Water Act prohibits the discharge of pollutants into waterways without the appropriate permits. Pennsylvania’s Stormwater Management Act (a/k/a Act 167), MS4 Program, Chapter 102 (Erosion and Sediment Control Requirements), and NPDES Permit Program for Stormwater Discharges Associated with Construction Activities are amongst the Commonwealth’s methods for meeting the runoff-related requirements of the Clean Water Act. Implementation of stormwater management efforts in Pennsylvania occurs at the community level because individual municipalities, such as Manor Borough, are ultimately responsible for adopting zoning ordinances, subdivision and land development regulations, and other programs that keep their locality’s runoff under control. Manor's Municipal Stormwater Management Ordinance was adopted in 2004. The 2015 Sewer Separation Project in the old section of Manor was a major step forward in the Borough's overall compliance. In the future, the Borough will be doing smaller sewer projects to ensure the infrastructure is in good shape and complying with the state mandates. New Construction in the Brandywine / Crimson Pointe area is already subject to MS4 regulations and specifications. The numerous resources below will explain what we can do to make our waterways and drinking water cleaner and safer. The items noted below with ** are available at the Borough Admin Office at no charge. 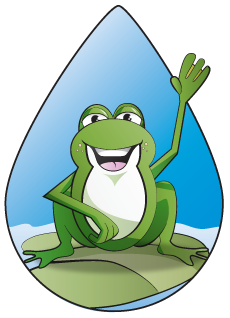 HomeOwner's Guide to Stormwater BMP Maintenance NEW! - Why Clean Water is Important! If you see or smell suspicious substances leaking into a storm drain, or into Brush Creek and its tributaries, report it! Click here for the Illicit Discharge Report Form. Either fill it out and forward to the Borough Admin Office IMMEDIATELY via FAX or email, or call the office at 724-864-2422. You will be asked to provide information to fill out the Illicit Discharge Report Form. Photographs encouraged. If you are looking for more Rain Planter designs and ideas, search for "Rain Planters", "Rain Barrel", "Planter Box", or "Rain Garden" in Google and/or Pintrest. Check YouTube.com for instructional videos. For less than $30 you can make your own rain barrel from a plastic trash can. Here is another DIY tutorial**. Not handy? Check out Rain Barrels of PA. Local residents save shipping costs by picking up barrels at their location. Take a natural trough (or create one) and turn it into a flower garden with native plants and flowers. Another option is incorporating a grassy swale** into your landscaping. Want to plant ;trees**? And if you live along a creekbed, here are some ideas for creating a riparian buffer**. No solids, No mulch, No trash, No pool draining, and No grass clippings! Control your roofwater with a Drywell**, and consider Permeable Paving** for your patio, driveway or walkways. 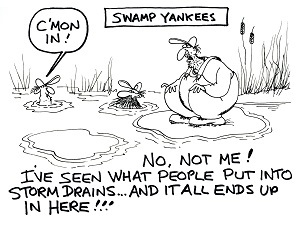 Stormwater basins/detention ponds are the most common stormwater control structures found in Westmoreland County. Many basins are not functioning properly. Outdated design standards & lack of maintenance may indicate that these ponds are not protecting our waterways from common nonpoint sources of pollution found in stormwater, such as sediment and nutrients. The Westmoreland Conservation District has a 2-part video series discussing issues related to stormwater basin design, assessment, retrofitting, and maintenance. You can find it on the WCD website: (scroll to bottom of the page). There are many videos on YouTube to explain the importance of MS4 and the methods of compliance and remediation. 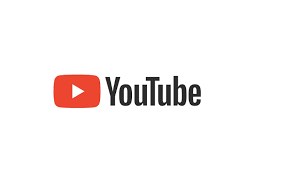 Those who are interested in learning more can search YouTube. You will find many links on how MS4 and stormwater is being implemented across the USA and around the world. 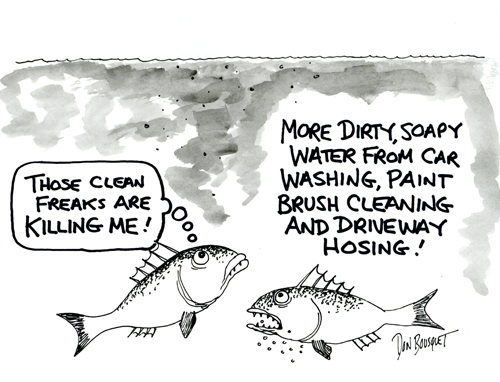 What goes down the storm drain goes into Brush Creek and its tributaries untreated! The PA DEP promotes and enforces MS4 and offers many resources and informational guides to both homeowners and local government. With the recent heavy rains and flooding, here is a resource for those who live along a creek or a stream. Here is the link to the local regional office in Pittsburgh. If you live along a creek or stream and want to do something to minimize flooding, there are many "Green Light" activities you can do without needing a permit: Guidelines for Maintaining Streams In Your Community. 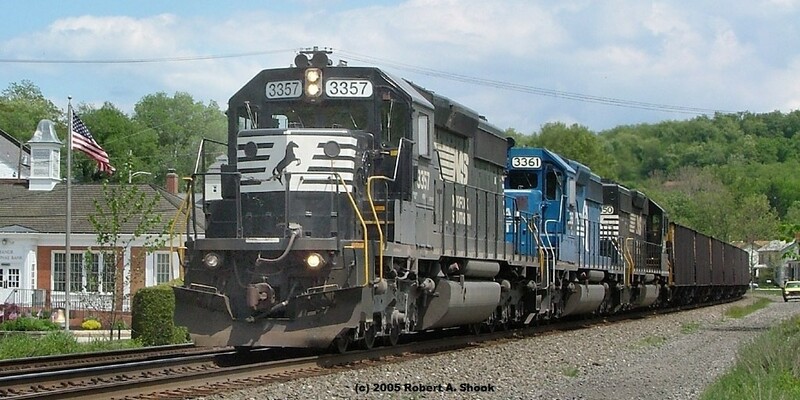 Should you have additional interests, start with the PA DEP main page. 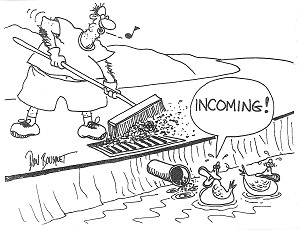 Do you know what's going down the storm drain? Only rain down the storm drain**! 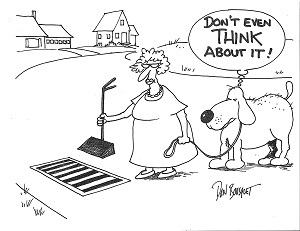 Don't dispose of pet waste in storm sewer grates. 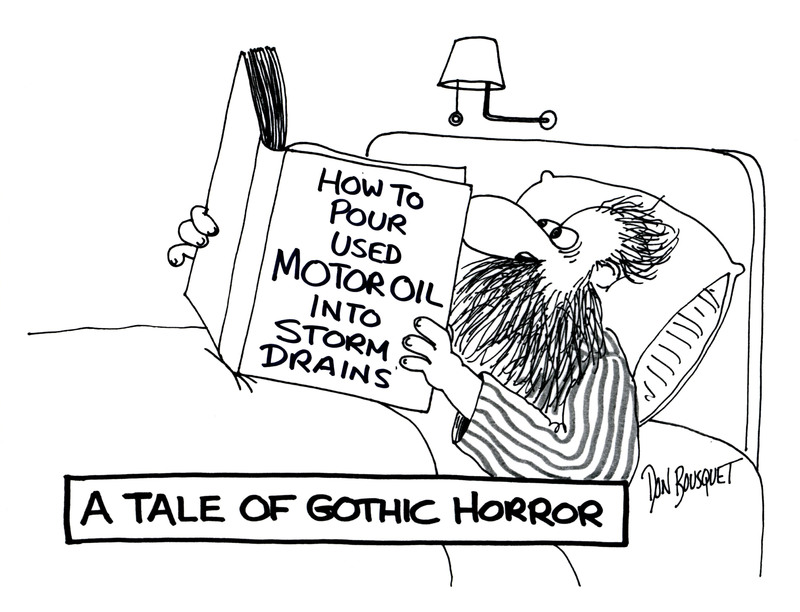 Don't drain your pool or hot tub in the storm drain. Don't let your car leak fluids. Don't use herbicides or chemical fertilizers. Go organic in your yard and garden. Brush Creek and Brush Creek Tributaries flow into the Turtle Creek Watershed, which in turn flows into the Monagahelia River. Shout out to Don Bousquet who created most of the cartoons used on this page.The Borough takes MS4 issues seriously. We use the cartoons to make a serious situation fun and a bit more tolerable.